You are here: Home / Uncategorized / Can the Local Fire Department be my Confined Space Rescue Team? Scenario: An employer evaluates and selects a local fire department using the guidance provided in Appendix F of the PRCS standard, Rescue Team or Rescue Service Evaluation Criteria. 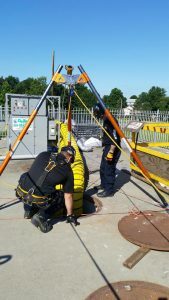 The employer has determined that the local fire department is adequately trained and equipped to perform permit space rescues of the kind needed at the facility. The employer has also made a performance evaluation of the service in which the employer has measured the performance of the team or service during an actual or practice rescue. However, the local fire department cannot guarantee that the rescue team will not be sent on another call during the employer’s permit-space entry operations. In other words, they have the ability to respond in a timely basis, unless another call prevents them from doing so. Question: If the employer selects this local fire department as its off-site rescue service, would the employer be in compliance with 29 CFR 1910.146(k)(1)? The employer must evaluate and select an off-site rescue service that has the capability to respond in a timely manner to the particular hazards at issue and to the types of emergencies that may arise in the employer’s confined spaces. The criteria employers can use in evaluating and selecting a service include determining whether the service is unavailable at certain times of the day or in certain situations, the likelihood that key personnel of the rescue service might be unavailable at times, and, if the rescue service becomes unavailable while an entry is underway, whether the service has the capability of notifying the employer so that the employer can instruct the attendant to abort the entry immediately. Compliance may require the employer to be in close communication with the off-site rescue service immediately prior to each permit space entry. In the scenario you describe, the employer must ensure close communication with the rescue service during entry operations so that if the rescue service becomes unavailable while an entry is underway, the employer can instruct the attendant to abort the entry immediately. Entry operations cannot resume until the entry supervisor verifies that rescue services are able to respond in a timely manner. http://scs.frontend.ifirehosting.us/wp-content/uploads/2016/03/logo_revised-1.png 0 0 Don Bessette http://scs.frontend.ifirehosting.us/wp-content/uploads/2016/03/logo_revised-1.png Don Bessette2017-01-09 17:40:172017-01-09 17:40:17Can the Local Fire Department be my Confined Space Rescue Team?